The good old bank transfer is considered to be the safest form of payment available nowadays. It’s no wonder that, whenever you have to deal with a larger amount of money when buying a house, for example, you pay via Bank Wire Transfer. If you already used this payment method to buy anything of great value, you can agree that it is among the safest ways to transfer big amounts of money from one account to another. However, what if we told you that you could also use a Bank Wire Transfer to deposit at online betting sites? It might sound a bit off, but it’s 100% doable, and several betting sites accept deposits through Bank Wire Transfer. Still having a hard time believing it? Keep reading, and you will discover the top Bank Wire Transfer betting sites and all the details about how to use this deposit method. Even though it isn’t, by far, a popular deposit method among punters, Bank Wire Transfer is present in almost every online betting site. Due to the processing time that can go up to 5 business days, it is hard to believe anyone would choose it for a dynamic activity such as placing bets. It could, on the other hand, turn out to be the only option available for some customers to make deposits. It’s known that e-wallets such as Skrill or Neteller have extensive lists of countries where service is not available. Moreover, if you can’t buy a PaySafe or if, for some reason, you don’t have a debit or credit card either, a Bank Wire Transfer might be the only solution. Using other country and currency combination can have you waiting for ten days for a bank transfer. One thing is certain, it is not a good method to use if you’re planning on placing in-play bets. For what’s worth, you can use Bank Wire Transfers for cashing out your winnings as well. 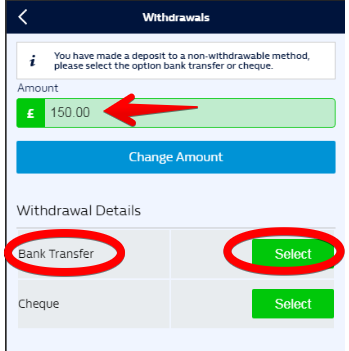 As you may have guessed, the fastest form of depositing via bank transfer is Chaps. This only takes one working day, however, has the downside of only being available for UK punters. If the phrase ‘only one working day’ seems a bit off to you, you’re probably right since most deposit methods are instant nowadays. However, compared to the usual five working days a standard Bank Wire Transfer can take, one day is actually fast. The list of big and respected betting sites that offer Bank Wire Transfer as a payment method is extensive. Paddy Power is one of those betting sites that, besides instant deposit methods and very fast withdrawal methods, also offer the classic bank transfer for those with no other alternative. You can use Bank Wire Transfer for both deposits and withdrawals knowing that there will be absolutely no fees involved in the process. Perhaps this is one of the reasons why some punters will even consider depositing with such a slow payment option. Knowing they get to keep all the money in case of a big transfer. Just like with William Hill, UK punters that choose Bank Wire Transfer as a deposit or withdrawal method have the perk of having their transactions processed within one working day. At the same time, punters from other territories can wait up to a maximum of 5 working days. One of the biggest advantages the Bank Wire Transfer has over other payment methods in the betting industry is safety. It’s true, other deposit and withdrawal options have their safety features and added security. However, nothing can compare with the Bank Wire Transfer. It is a transaction that takes place directly between two banks, the bank where the punter opened the account and the one where the betting site has an account. This makes it impossible to fraud or attack the transfer in any way. It’s true that the vast majority of betting sites do not take fees for other payment methods as well. However, the big plus that comes with using a Bank Wire Transfer comes from the fact that the bank won’t apply a fee either. In comparison with all other payment methods, no matter if we’re talking cards, or e-wallets, all the money you win at the betting site reaches your account. Especially if you’ve won a big amount of money, it’s worth waiting the extra few days. Another advantage that comes can be linked with using a Bank Wire Transfer to make transactions on betting sites comes from the ease with which you can track these payments. Every Bank Wire Transfer has its unique reference code that can be used to verify the status of each payment. Especially useful for those punters that have a hard time completely trusting the betting sites. Perhaps the only real advantage you get when depositing via Bank Wire Transfer is represented by the high limits. While other payment methods have a maximum limit of £2.000 or £5,000, a Bank Wire Transfer can go up to £150,000. Sure, you might say that it’s stating the obvious with this one. However, speed is very important in the betting industry. Moreover, this principle does not only apply for betting sites that need to be on their toes to remain competitive. It applies to punters as well since a few minutes can make the difference between winning or losing. Having to wait a maximum of 10 working days for your deposit to go in can mean missing an entire championship if your timing isn’t right. It doesn’t apply to all betting sites, however, using a Bank Wire Transfer to make your deposits can sometimes mean a very high minimum deposit amount. While other payment methods allow you to make deposits as low as €5, a Bank Wire Transfer minimum deposit can be as high as €200. That’s the case for bet365, in case you had trouble believing that. As we’ve already established, Bank Wire Transfers are payments made between banks. A payment system that is not that popular at betting sites, however, one that you can use in most of them. If you’re wondering what the steps are to initiate a successful Bank Wire Transfer, here’s a complete guide. Contact the bank where you have an account and let them know you want to perform a Bank Wire Transfer. Make sure that the amount you want to deposit is available in your bank account, in the currency you have selected on the betting site. You will receive a form that represents the initialisation of the Bank Wire Transfer procedure. On this form, you will enter some personal details as well as banking details of the recipient for the transfer. In case you don’t have all the needed banking details for initiating the Bank Wire Transfer, contact support department of the betting site or check the FAQ section. Make sure to write down the reference number of the Bank Wire Transfer so that you can track its progress later or hand it over to the support department in case there’s a delay in the payment. Depending on the country where you’re depositing from, you can wait for up to 10 days before the deposit reaches the betting site. Once the deposit is processed and approved, place your bets and make the most of it! Access your account by entering the username and password and clicking ‘Log In’ afterwards. You will see a new page with several categories. From the Payments category, click on the ‘Withdraw button. In the next window, select the amount you wish to cash out and the preferred method. In this case, Bank Transfer. Press the “Select” button. On the next screen, you’ll have to enter all the details regarding your bank account as well as an entire set of information about your bank. It is very important that you ask your bank to provide these details as getting them right is vital for the entire Bank Wire Transfer. The details you will have to complete are different depending on if you have a UK bank account or not. After you inserted all the details, click ‘Continue’ to move on to the next page. The next screen will bring you a summary of the withdrawal request. Make sure everything is all right, write down the Transaction ID in case you want to check the progress of your withdrawal, and then click ‘Continue’. The fact that Bank Wire Transfers are different from any other payment methods is already notorious. So, nobody can expect the times, fees or limits to be anything similar to what he or she encountered so far. If you’re curious to learn exactly what are the parameters of Bank Wire Transfer transactions, we’ve prepared some data for you. 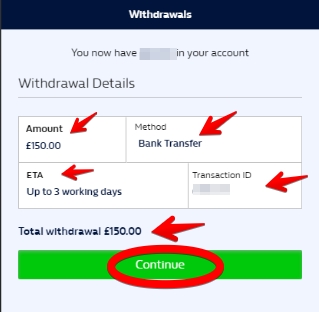 Do I Need to Provide My Betting Site Username when Depositing via Bank Wire Transfer? Even though it isn’t a mandatory field with most of the betting sites, it is a good idea to mention the username when depositing with Bank Wire Transfer. It will save the betting site employees much time in identifying your account and uploading the funds. Can I Use Bank Wire Transfer Within and from the UK? Of course! All UK-registered banks support both internal as well as international Bank Wire Transfer transactions. These include betting sites as well since it’s a standard bank account to bank account transfer after all. The process can be faster and a lot simpler to go through if you’re using Bank Wire Transfer with a UK account. Are There any Territories that Can’t Use Bank Wire Transfer? What should you know about Bank Wire Transfers?